* Product and feature availability may vary by region. When ransomware strikes, it can be very disruptive to your business. Getting users back to working quickly depends on having easy access to the latest versions of uninfected files and being able to restore them quickly. 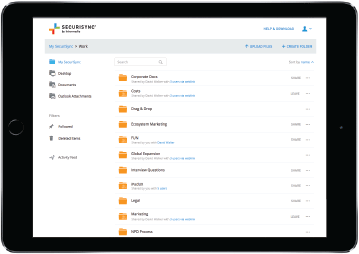 SecuriSync offers both: in the event of ransomware infection, just select the folder you want to restore, select the target point in time—down to the minute—and press the button. Your folders are instantly rolled back to their state at that point in time. A user can then access those files instantly through the web or mobile devices, even as they’re re-syncing to the user’s computer.